If you grew up in the 60s like I did, you'd open your lunch box or brown-paper lunch sack at school, sort out the inventory and shudder -- mom packed carrot sticks. Again. Moments later it au revoir carrot sticks. They were not exactly a hot commodity on the black market in the St. Rita's lunchroom. 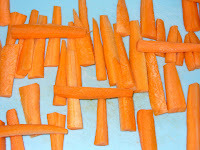 In the 1960s, carrot sticks were ubiquitous. Even when you went home for lunch like I did the first few years of grade school, there they were. Front and center. Next to the bowl of Campbell's tomato soup and perfectly plated dome of cottage cheese, usually accompanied by a pineapple ring or canned pear, topped off with a dollop of mayonnaise (the real kind, homemade) and accented with a jaunty dash of paprika. So, I've come full circle. After committing to losing some weight last summer (17 pounds and counting), carrot sticks have become my new best friend. Of course, it doesn't hurt that, unlike St. Rita's Grade School circa 1962, I'm eating organic, locally grown carrots perfectly chilled courtesy of the two refrigerators in the break room at rk. And it doesn't hurt that I can subtly (maybe not so. . . note to self: should probably check with my co-workers) take out a bit of workplace aggression at my desk by chopping on this humble root vegetable . That never occurred to us at St. Rita's. Probably a good thing considering eating at your desk wasn't allowed.